Some time ago, we had reported how an Uber self-driving car operating in an autonomous mode was involved in a crash that killed a woman crossing the street in Arizona. 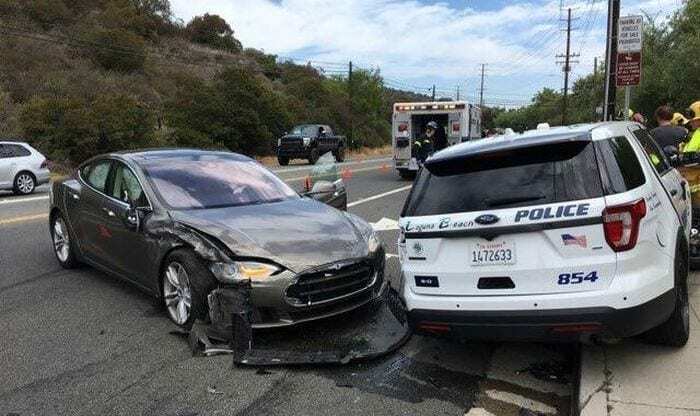 Now, reports of a Tesla Model S crashing into a parked police vehicle in California on Tuesday morning while ‘Autopilot’ mode was engaged has emerged. According to Sergeant Jim Cota, a public information officer for the Laguna Beach Police Department, the Tesla model S sedan was on Autopilot mode and travelling at around 40-45 mph when it deviated out of its lane and crashed into the side of the parked police car in Laguna Beach, California on Tuesday. Cota posted photos of the crash scene on Twitter showing significant damage to the front end of the Tesla and the rear side of the police vehicle. At the time of the collision, the police department vehicle was unoccupied, while the driver of the Model S sustained minor injuries, Cota wrote. The driver of the Tesla S car, a 65-year-old from Laguna Niguel, California, told officers that he had engaged the car’s partial self-driving system, called Autopilot. “He told us in his own statement he was in driver-assisted mode,” Cota said. Even though Autopilot was engaged at time of the incident, investigators said that they are still working to find out the exact cause of the accident. While echoing previous warnings about the limitations of the company’s semi-autonomous features, a Tesla spokesperson said on Tuesday, “When using Autopilot, drivers are continuously reminded of their responsibility to keep their hands on the wheel and maintain control of the vehicle at all times.” The system can keep a car in its lane and adjust its speed based on surrounding traffic. Tuesday’s collision is the latest in a string of similar accidents involving vehicles with Autopilot activated. Earlier this month, a 28-year-old Utah woman driving her Tesla Model S in autopilot mode was injured when she slammed the vehicle into the back of a stopped fire truck while cruising at about 60 mph. Similarly, in March, a Model X SUV on Autopilot mode crashed into a highway safety divider killing the driver in Mountain View, California.